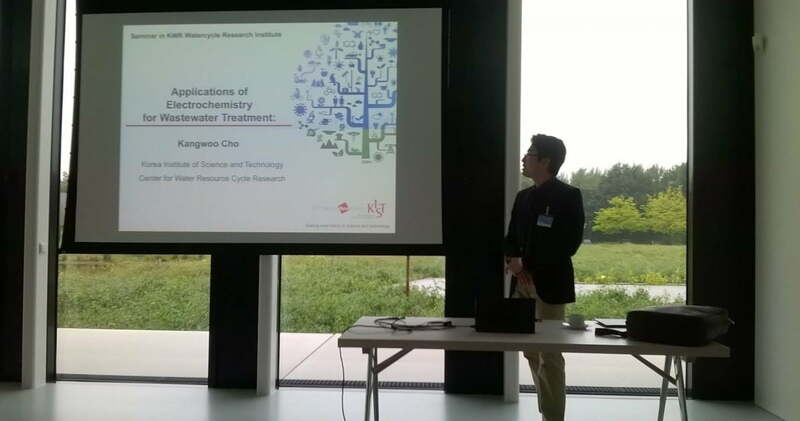 Dr. Kangwoo of KIST visited KWR on the 22nd of August for a presentation of his research and discussion with KWR experts. Dr. Cho has previously won a prestigious Bill and Melinda Gates Grant for the development of a wastewater treatment system that incorporates an electrolysis cell for on-site wastewater treatment. This was also the topic of his talk at KWR. Electrolysis results in disinfection and degradation of organic compounds, which was first established in lab-scale experiments followed by demonstration projects in India and China. As a KIST researcher, Dr. Cho also attended the launch of the Watershare Community of Practice on Emerging Substances during the Singapore International Water Week on the 11th of July. Based on these two meetings KWR researchers dr. Emile Cornelissen and dr. Cheryl Bertelkamp together with Dr. Kangwoo Cho will explore the potential for collaborative research into biological treatment of organic micropollutants.